HomeMonsters in the Movies: The Dark Crystal Skeksis-to-URru Guide! Monsters in the Movies: The Dark Crystal Skeksis-to-URru Guide! This is a repost from my old blog, but I was inspired to bring it over after seeing The Dark Crystal on the big screen last week with Steve and my old high school pal Stephanie. What a great time! Dear readers, if you’re as obsessed with The Dark Crystal as I am, you want to know all the names of both the urRu Mystics and the Skesis, and even moreso, you want to know who is whose counterpart. Well, I made a guide. I apologize for the quality of the images. I could not make screencaps, so I took photos. You can never learn the names without the novelization. I could not have compiled the guide without it. The book is quite exciting, gritty, graphic, and follows the movie exactly–it simply details and fleshes out some scenes even better than you could imagine. Copyright 1982, Henson Associates, Inc.
EDIT: One photo in the guide was taken from The Book of Habidabad, a very very detailed Dark Crystal site. 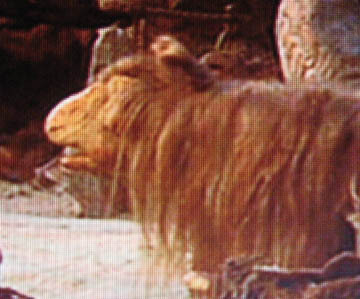 I simply could not get a good shot of urNol the Herbalist with my DVD, so I used a photo from this site. 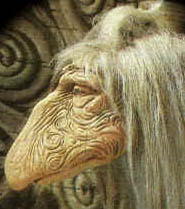 The Dark Crystal‘s Skeksis and urRu–who goes with whom!